These accompany a forwarded message from an unhappy Amazon customer. The employee who receives such an email has a few hours to solve the problem, find out what caused it, and get the response to Bezos. Bezos's dedication to each Amazon customer is not eccentricity or a cheap PR trick. It's the centerpiece of the philosophy he calls “Day 1”—the idea that companies should never take their eyes off making their customers happy. “Day 2” is where “process” and “metrics” take over “results” and companies start stagnating before declining and fading away. In the case of Amazon, Bezos serves as the guardian of the company's customer-centric approach—it takes the CEO himself to make sure that all teams within the company keep that focus. This is a testament to the challenge brands face today at implementing and keeping that sort of customer-focused approach across all teams in the company. For SaaS companies, it's even more important to develop this type of focus on customers because of the business models most of these companies use. Having one person, or even one department, serve as the voice of the customer internally is not enough. Instead, they need everyone in the organization to understand what it takes to provide the customer service that makes customers happy. The SaaS model has turned software development on its head. In the past, companies sold licenses to businesses, meaning they could pay back the investment made developing and marketing the product right away. Today, software companies make money on recurring revenue subscriptions. They have to slowly recoup their CAC over a customer's lifetime, making customer happiness and retention critical. The result of this is that the customer development process becomes chaotic, features shipped are hit-and-miss, and the company as a whole becomes less productive. Teams that lack the live connection and feedback from customers start using proxies, like the number of features shipped, to measure their success. Before they know it, it's Day 2. That's why slapping “customer centric” in the mission statement and having a dedicated department that “owns” customer success is not enough. Teams working on SaaS products always need to make customer centricity part of the fabric of the company—including the process for product development, the culture that governs the internal activity of the organization, and how teams are structured. What follows are examples of how companies have implemented specific tactics across these three areas to ingrain a customer-centric mindset successfully across the whole organization. You can use them separately, or as a 3-step process to instill the same focus on customers across every team in your company. Traditional approaches towards building software products, such as Waterfall and Agile, lean heavily towards output—shipping as many features as possible. That's why these methodologies need a high level of stability—once tasks are prioritized, there's little flexibility about changing them, even if there's clear evidence customers are looking for something else. This often leads to feature creep or shipping out improvements that don't work well together. 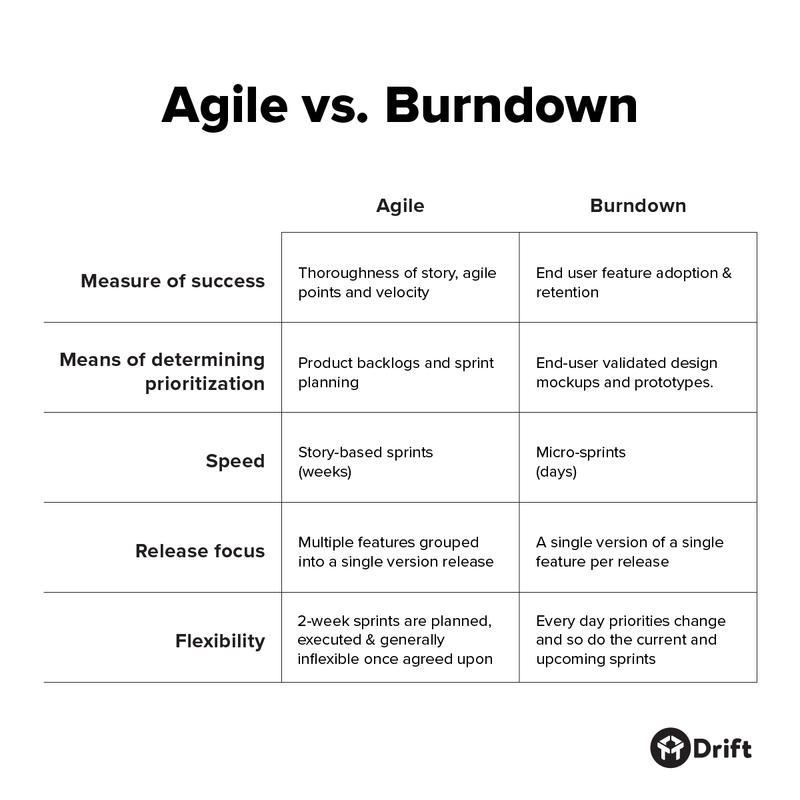 Drift is one of the companies that has realized the limitations of these traditional approaches, and has set out to build their own methodology, which they've called Burndown. To get this customer-centric approach to span across departments, it's critical to work with both internal and external clients. David Cancel implemented this at HubSpot before he founded Drift—rather than just communicate the most common problems, the support team was tasked with analyzing and prioritizing them for the engineering department, thus getting “a seat at the table” when decisions about product development were made. To get teams aligned and working together productively, Cancel recommends setting shared goals and measuring them with shared metrics. This helps minimize the risk of teams getting siloed in chasing metrics that are relevant only internally. In the Amazon example, we see that Bezos uses every opportunity to remind his employees that customer happiness is the true measure of success of the company. For SaaS teams communicating with customers, this is even more important because it's not just a way to prevent and solve issues, but something that guides decisions about product development, marketing, etc. That's why a number of teams—and not just early-stage companies that are spread thin for resources—choose to use a practice called All Hands Support where every team member takes a turn in talking to customers either to solve problems or just check on them to make sure they're happy with the product. For companies like Wistia, getting everyone on the team to talk to customers serves as a handy reminder on where the money for each paycheck comes from. It also makes it quicker and easier to provide a solution when customers come to the team with issues. There is no better way to do this than to make sure that everyone has a pulse on customer needs. All Hands Support is a popular way for SaaS startups to develop a customer-centric worldview. However, as companies grow and add more people, they begin to realize they need dedicated team members who keep the team focused on the customer. Often when a team gets a “customer success” member, that person becomes a gatekeeper for all customer communication. Similarly, product managers often become a wall between customers and the team. That's why a number of companies, including ourselves, HelpScout, and others, choose not to have product managers at all. Increasingly, you need multiple people who serve as the voice of the customer at the table. Customer feedback isn't just important for scoping features but should be considered at every discussion and decision. To achieve this, FullStory added a new role to their team. “Huggers” work on the intersection between customer success, support, and product development without being part of any of those departments. That way, the FullStory team gets a role which is focused on making the customer experience the lifeblood of the organization. Instead of product managers who optimize the number of shipped features, or customer support reps who track how quickly they're closing tickets, “Huggers” are the people who “meet” customers when they're frustrated with the product, help them find the best solution, and then serve as their advocates making sure they keep the team focused on improving the experience users get. By embedding the Huggers deeply into every process, FullStory wants to make sure the customer experience is at the center of how the team is developing the product. Customer centricity marks the start of a new age of product development. With better technology to observe and collect feedback from customers and faster production cycles, no company will have the luxury of developing their products away from the people who use them. Moving quickly to build, validate, and improve new features is quickly becoming the default way to build products. As challenging as that sounds, it is actually a great opportunity. Keeping development close to customers allows product teams to drastically cut the resources wasted on features that nobody wants. It also lowers the uncertainty and stress of creating something in the dark, not knowing how it'd be met by users. All of this makes the whole process scalable and repeatable. The extra resources that get freed up when a team switches to building around the needs of customers can be used to develop an even stronger aptitude towards understanding and serving customers. In Hiten Shah's words, this is the quickest and easiest way to win any market.